Tim Cox “Sees” a Lot More Life than Most Folks Do, reads the article headline from the Florence Morning News of Sunday, May 4, 1986. This just one of dozens written over the years about the 58 year old native of Kingstree, South Carolina, who at age 5 developed juvenile diabetes. Insulin shots became a way of life for this little boy, in the days when there was very little sugar-free anything to satisfy a child’s craving for sweets. A constant dietary balancing act became his mother Ora Lee’s way of life; as were frequent trips to the doctor’s office or hospital. As Tim grew, he determined to never let diabetes stop him from accomplishing the important things in life. He joined the high school tennis team, played french horn and the trombone in the marching band, he water skiied, and he had a ton of friends. In 1964 he graduated from Kingstree High School (celebrating their 40th class reunion with Tim as primary instigator June 2004). He went on to business school, began work as a computer programmer, and got married. His daughter Angelia was born. And then Tim started having vision problems. He underwent laser treatments, traveled to Dukane University in Pittsburgh to be trained as a blind programmer, and by Labor Day 1974, Tim began losing his eyesight. A month later his kidneys failed. Up until that time, diabetics in South Carolina had never been put on dialysis. They were left to die. But Tim wouldn’t give up, and after many agonizing days of praying, pleading and waiting, he became the first diabetic ever to be put on dialysis in South Carolina. His wife learned how to do home dialysis, but the many pressures of his illness soon led to separation and later divorce. Once again Tim had to rely on his parents, family and friends, and a lot of prayer. Eventually Tim’s mother learned to operate the home dialysis unit, and the family settled into a precarious routine. Tim refused to settle for being “disabled.” He got involved with his whole heart in the community — serving on local boards for the American Diabetic Association (ADA), American Cancer Society, Kidney Foundation, and Jaycees. He helped found the Black River CB Club and organized such activities as the “Coffee Club Patrol,” calling drivers in from the highway to raise funds for house fire victims. During these years, Tim won many awards: Outstanding Jaycee in South Carolina, 1978; Kingstree Jaycee of the Year 1979, and the Adam Fisher Award of the ADA, 1981. He was a member of the Committee on Computers for the Physically Handicapped based in Chicago, Illinois, the South Carolina Physically Handicapped Society and the National Federation for the Blind. He kept very busy between dialysis treatments. In 1978, after four years of ups and downs with dialysis, Tim and his mother traveled to the New England Deaconess Hospital in Boston and Ora Lee donated a kidney. Tim arrived home from the hospital at 12:05 AM, Christmas Day 1978. A month later, he became public affairs director and talk show host for WKSP radio in Kingstree. He owned a 1976 Datsun 280Z, and with driver Joel Stone, in 1979 he competed in several Sports Car Club of America races, coming home with first or second places. Blindness Didn’t Stop Him, reads the headline from a Florence Morning News article of 1983. Tim had determined to get on with his career and enrolled in Francis Marion University in Florence. He moved to Florence, rented a room in a boarding house, and still owned a car. “It’s a lot easier to bum a ride if you have your own car,” he said. About that time, Tim met Bette Gaymon at a Full Gospel Businessman’s meeting in Florence, where she served as pianist. They began dating and were married on Christmas Day, 1984. Diets and insulin shots became the way of life for yet another person in Tim’s life. 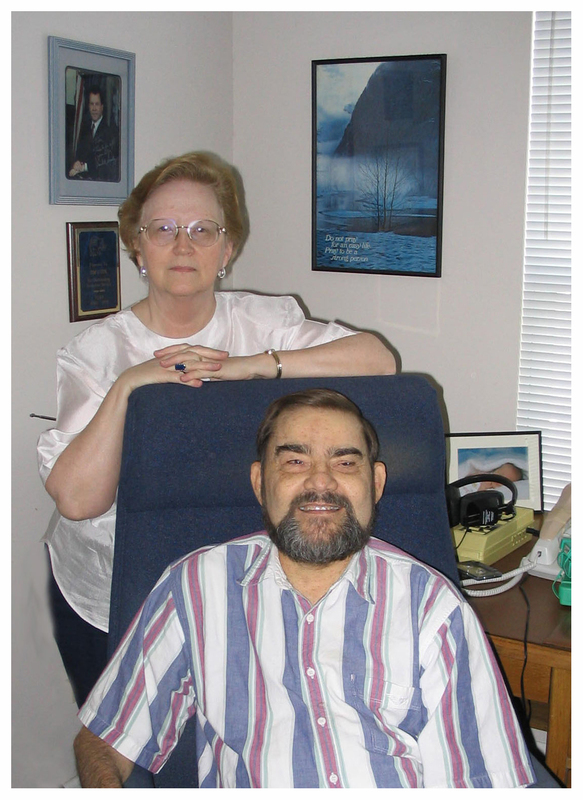 When Tim’s contract with the technical college ran out, he and Bette opened their own business, Executive Services of the Pee Dee, Inc., a full-line secretarial service. It was May, 1986. Tim and Bette both got involved in their community. With Bette at the wheel of his car, Tim became a popular spokesman for the ADA, speaking to civic and church groups across the state. Both joined the board of Crimestoppers of the Pee Dee, and Tim took up playing his french horn again, joining Bette in the music ministry of their church. Their business grew and expanded along with their community activities. Tim Cox Receives President’s Trophy, reports a May 1988 headline from the Florence Morning News, as Tim was named Florence’s Handicapped Citizen of the Year. This award was followed by being named South Carolina Handicapped Citizen of the Year for 1988, as well as Employer of the Year of the Handicapped, recognized for hiring handicapped employees for his business. By 1987, Ora Lee’s donated kidney had begun to fail. Despite the tightest blood sugar control Tim and Bette could achieve, diabetes had taken a toll on the transplant, and Tim began to study the possibility of a pancreas transplant to stop the diabetes completely. There was one obstacle — he also had coronary and other major artery disease, likewise a result of diabetes. “Get your arteries fixed, and then we’ll talk,” said the physicians. That didn’t seem to be an option at the time. But in May of 1987, Tim was admitted to the hospital with unstable angina, and while an inpatient on the cardiac floor he suffered cardiac arrest. An emergency pacemaker saved his life and ten days later he underwent triple bypass surgery. Later that year, his right leg had to be amputated due to gangrene. Diabetes had wrecked the peripheral arterial system in the leg. After recovering from all that, Tim made another call about the pancreas transplant, and after traveling alone in September 1988 to the University of Minnesota Medical Center for a complete examination, he was accepted as a candidate for a double kidney-pancreas transplant. Since the kidney was already weak, they must replace it also. While Tim awaited a donor, this time he began fund raising efforts for himself — in 1988, insurance companies considered a pancreas transplant experimental and wouldn’t cover those costs. Tim Cox Never Gives In To Fate said Charlie Walker in a December 14th newspaper column in the Kingstree News. “Tim Cox believes when you’re handed lemons, you make lemonade,” quipped Charlie. He pointed out all the other people Tim had helped over the years, and the fact that now Tim needed help. Charlie organized a Jail-A-Thon to help out. Civic clubs, church groups, friends, business acquaintances, and even strangers — people all over the state began helping out. Billboards went up all over the county: “Tim Cox Needs $100,000.” A trust fund was set up by a local civic club, a beeper was donated, and money started coming in. On December 23, 1988, the call came in. “We’ve got a perfect match. You need to get here within twelve hours.” But the private planes Tim had lined up weren’t available due to the holidays. And all the major airports connecting to Florence were fogged in, so he couldn’t get to Minneapolis on a regular airline, even though Florence skies were clear. Desperate calls went out for a private plane, and one was finally found in North Carolina. Friends, family and news reporters waved goodbye as Tim’s parents, Tim and Bette flew out of Florence, headed for Minneapolis. By this time Bette’s daughter Shelby Powell was helping run the business, a tremendous blessing over the weeks ahead. The transplants took place on Christmas Eve. All day long Tim’s parents and Bette sat, stood, paced the floor and prayed in the nearly deserted waiting room, and finally Dr. David Sutherland, head of the surgical team, came out with the news. The pancreas and kidney were working fine — the pancreas fired up immediately when the last stitch went in and Tim no longer needed insulin shots. Over the next two days, bleeding problems necessitated two more surgeries, but thirty days later Tim was back home in Florence and well on the way to recovery. Diabetes was no longer a problem but fund raising had to resume, with talent shows, gospel sings, auctions, and a myriad of other events. Slowly but surely, the community responded and enough funds were collected to defray most of the medical bills and medications not covered by insurance. Today, over 15 years later, Tim is busier than ever. The transplants are still working fine, and Tim is a true advocate for pancreas and kidney transplants, and of course organ donation. The disease was stopped in its tracks, but the damage already caused by diabetes wasn’t reversible. Tim lost his other leg in 1989 and later most of his fingers. He’s had several small strokes which affected his hearing. However, he still runs his business, still plays his french horn for church, and is still active in community affairs and politics. In 1991 he organized the UP (for Used Parts) Club, a support group for transplant patients of all types, and established the Carolina Transplant Foundation, a nonprofit organization designed to assist patients in fund-raising. He received WBTW-TV13’s “Giving Your Best” Award in 1991. In 1992 he added another division to his company, Advanced Insulation. He was named Florence County Republican Party Volunteer of the Year for 1993-95, and received the James B. Edwards Award of the state Republican Party in 1998. Tim could never have survived, much less accomplished all that he has, without the help of his family, his multitudes of friends, and his faith in Jesus Christ. Every time there was a medical setback, a call for prayer went out across South and North Carolina and things took a dramatic turn for the better. A special Bible verse came to Tim’s mom Ora Lee during a critical period, and over the years it has been a great source of strength. If you don’t remember much else about Tim Cox, remember that verse: “With long life will I satisfy him, and show him my salvation.” (Psalms 91:16) That is the reason that still today, Tim Cox “Sees” a Lot More Life than Most Folks Do.